The tread depth should be measured in the principle grooves. These are the ones which contain “tread wear indicators”, which are raised sections in the base of the groove. They are usually 1.6mm to 2mm above the base of the groove. Measure each groove depth across the tread width and in several places around the tyre circumference. 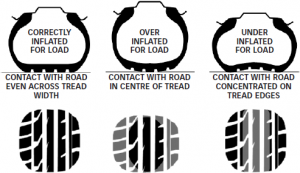 The recommended tyre pressures for your vehicle will be found in the vehicle handbook or on a placard mounted on the vehicle e.g. behind the petrol filler cap or on the driver’s door pillar. Always check pressures when the tyres are cold, never adjust tyre pressures during or immediately following a journey. Check tyre pressures every two weeks and adjust when necessary. Always refit the valve cap. Low tyre pressures reduce the tyre’s performance and increase fuel consumption. It is advisable to obtain a reliable pressure gauge which can be purchased at most motorist centres at a reasonable cost. Tyres deteriorate with age and if cracking or crazing is present it may indicate that the rubber has perished and the structural integrity cannot be assured. The tyre should be immediately removed from service until it has been checked by a suitably qualified tyre expert and if there is any doubt replaced. If you are in doubt about the condition of your tyres have them inspected by our experts at Continental Murrumbeena or call 03-9579 0007 .